Brannon Addison an artist that specializes in hand embroidery. While pursuing a career in education and nonprofit communications, she turned to drawing and painting as a creative outlet, which resulted in the launch of a stationery line in 2011. Following an ankle injury in 2014, she taught herself how to embroider and fell in love with needlework. 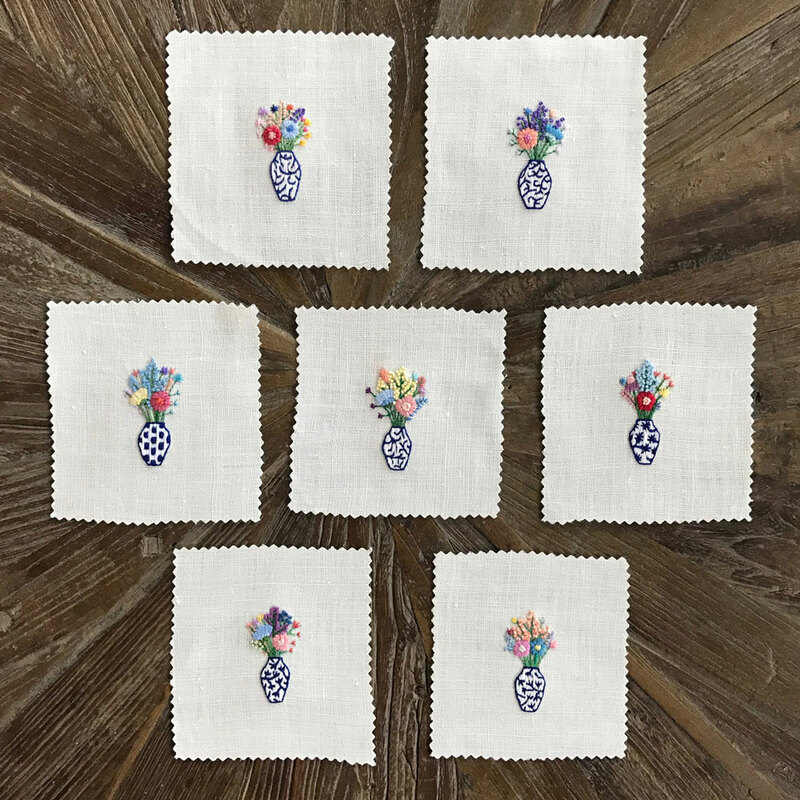 Brannon releases monthly collections of her framed embroidery and has extended her work into pillows, pins, and clothing as well. Find more of Brannon's work on her website and Instagram. When it comes to my artwork, the internet doesn’t really play a large role. Most of the time I’m in a chair with my needle and thread, and one of the things I like the best about hand embroidery is that I’m not tethered to a screen all day! When I’m using the internet professionally, it is usually to research vendors for the materials I use in my work, to manage my online shop, and to do promotional work on social media. Lately, I’ve enjoyed looking at embroidery, textiles, and decorative arts from the online catalogues of some of the top museums - The Metropolitan Museum of Art and the Victoria and Albert Museum, in particular, have amazing online resources. I find most of the inspiration for my work from nature - whether it’s the flowers I come across while taking a hike or the pine trees right outside my door. I live in Southwest Colorado where the seasons are very distinct, so there is always something outdoors that catches my eye. I also take inspiration directly from the artwork I have created for my stationery line (also sold under Happy Cactus Designs). I’ve recreated a few card designs with thread, and it has been fun to translate the design from one medium to another. I love reading fashion magazines and looking at designers’ runway show presentations. It’s my favorite source for color inspiration. My mom has amassed an amazing collection of art, interior design, and garden books over the years, so whenever I am home for a visit, I spend time thumbing through big stacks. My blue and white vase series was inspired by some of her books on floral arrangements. I also love looking through books on textiles from around the world, especially those featuring Indian block prints, 18th and 19th century embroidery, and Islamic textiles. My embroidery work is usually done freehand, and I typically don’t sketch out what I am going to stitch beforehand, so it’s less planned out than one might imagine. I usually have an idea in mind of what I want to do, but I kind of just see where the needle and thread take me. When it comes to looking at social media for inspiration, I follow fashion designers (the Gucci and Valentino feeds are two favorites that are full of eye candy) and a number of gardening and flower accounts. It’s a great way to come across different types of flowers I may not be familiar with. 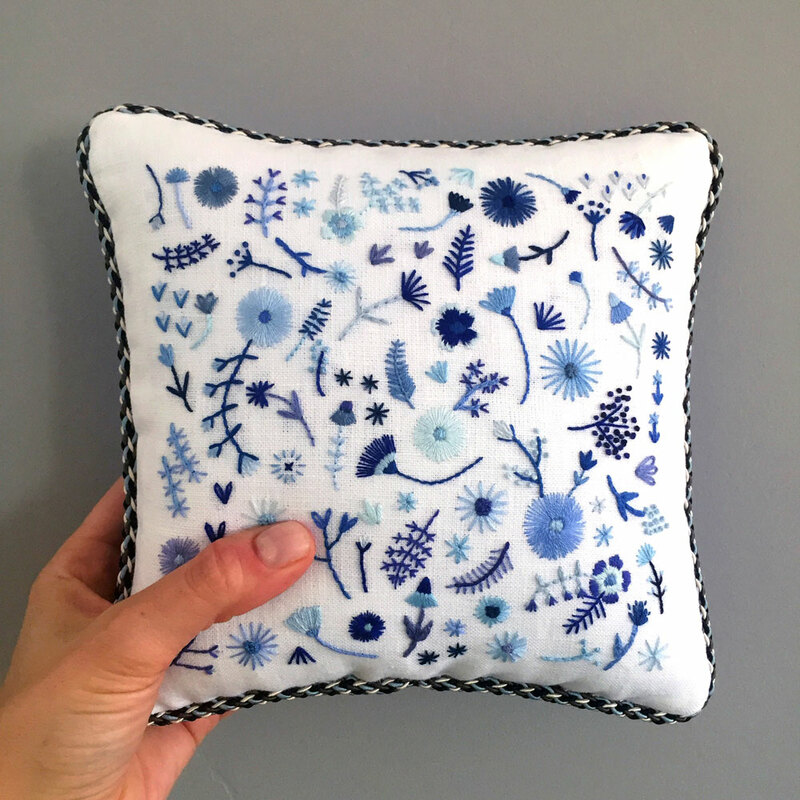 Instagram has been a fabulous way to share my work with a wider audience as well as an inspiring place to connect with other makers and develop friendships. I’m so grateful for the community I’ve developed on the platform. That said, I’ve encountered a number of instances where people have directly copied my work or inappropriately passed off an image of my work as their own. It does feel quite violating and leaves me with an icky feeling. Most of the time it’s actually been other kind Instagram followers who recognize my work and share with me how someone else is copying it. Sadly, I have come to anticipate copycats because I don’t think many people are familiar with copyright laws and the ethics behind copying another artist’s work. Over time, I’ve grown to see these instances as educational opportunities. When I come across someone copying my work, I usually reach out to that person via a private Instagram message or email and calmly and professionally explain to them that they are infringing on my copyright to a particular work. I try to resolve the issue by explaining that my work is protected by copyright and cannot be recreated. Oftentimes, people seem to be apologetic and naive about copyright in general. They didn’t realize they were doing anything wrong. In other instances (which have been few and far between), I’ve had people be rude, confrontational, or even block me. The best I can do is try to educate people about copyright, and to encourage them to create their own original works or to practice and learn embroidery by purchasing patterns from designers who create and sell work specifically for that purpose. Although an artist’s work is protected by copyright laws once it is created, I also file formal copyrights for my works through the Library of Congress’ U.S. Copyright Office for added protection. In the end, I try not to worry about it too much, because it can really bog you down. My best move is to keep my head down and create new (and even better) works. First, take the time to learn about copyright laws. It is a complex subject, but there are good resources specifically out there for artists and creatives. It’s important to learn how to protect your work. Second, create work that represents your own unique style. To stand out in a busy marketplace, you really need to have an original point of view and design aesthetic. I’m always reminded of Rifle Paper Co.. Years ago, Anna Rifle started a painterly stationery line with a fresh take on florals, people, and whimsical designs. Her work is imitated by other stationery companies all of the time, and not only is it obvious that they are just copying her work, but it’s never as good as the original. And finally, look beyond your own medium for inspiration. Diversify the places where you seek out inspiration from. Design*Sponge is a perennial favorite for learning about other creatives. I am in awe of paper artist Matthew Shlian’s work. I bought a piece of his a few years ago as a birthday present to myself and sometimes just find myself staring at it! Lately, I’ve been loving the posts of standout wallpaper and fabric studios - Schumacher, Pierre Frey, Gracie Studio to name a few favorites.